Last week, I presented a session titled, Unicode Made Easier with SQLite at the Southwest Fox 2014 conference. At the end of the session, an attendee asked about manipulating strings, specifically using SUBSTR() on UTF-8 encoded strings. Last night, I played around with creating my own SUBSTR() function to deal with UTF-8 encoded strings, and I think I may have been successful, but I'm not sure. 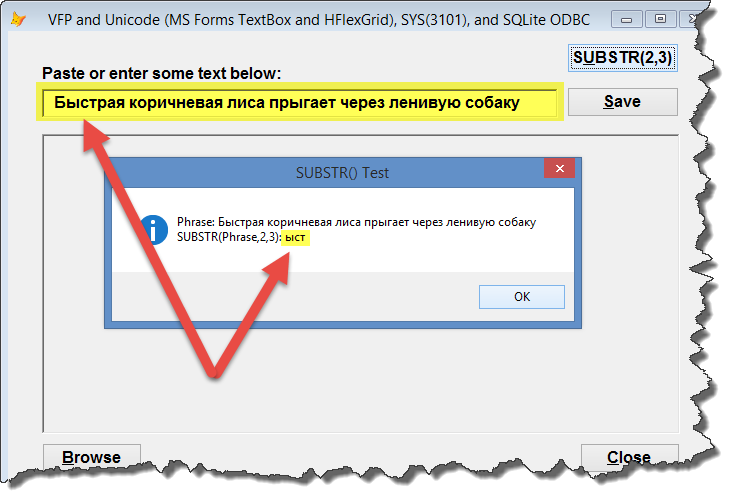 If there are any readers that can tell me if the image below looks correct for a SUBSTR(2,3) on the Russian phrase in the textbox, I would appreciate it very much.